South River Topwater Fishing: Tashmoo!!! I spent this last week on Martha's Vineyard with my family and 2 of my daughters boyfriends. We rented a wonderful cottage on the shore of Lake Yashmoo. I had never been there before and my vision was quite different from the reality. The island is actually quite rural and our place was more like a cabin in the woods on the shores of a freshwater lake. On Sunday a friend mine Joe, who has a summer place on Cape Cod, picked us up in his boat for some "Bass" fishing (stripers). We worked a long rip the runs the entire northern part of the island along the Vineyard Sound. While Joe and his boys worked bottom rigs, Danny and I had brought Popa Dogg north to show them how its done. It was not long before both of us had huge slams and boated 5 pound blues. Popa Dogg continued his dominance as we each boated 3 more blues, before Danny boated the first "Bass" of the day, a 24 inch beauty. Joe explained that their minimum keeper sized fish is 28 inches and that Bass in general had been few and far between. As a matter of fact, he said that was the first Bass for him this year. 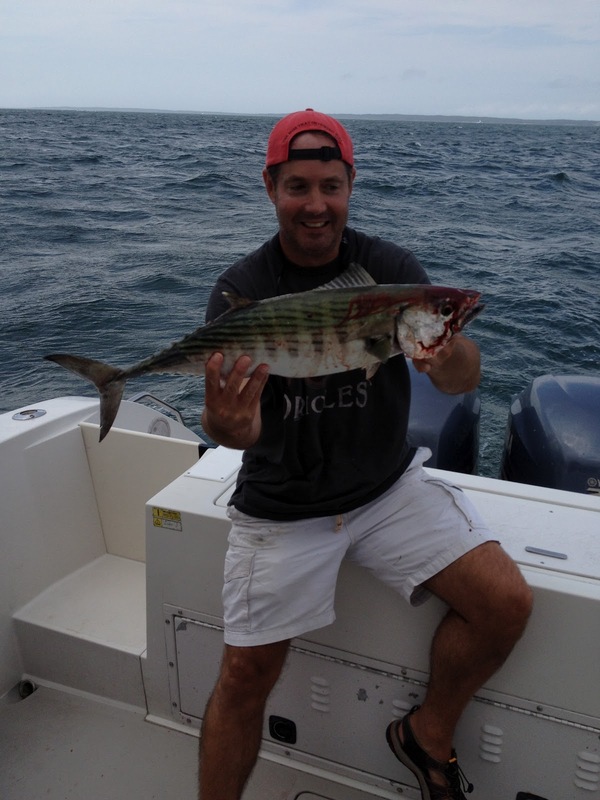 One of his boys boated a 20, which they called a "Schoolie". We continued bail blues when I had the biggest blow up of my life. 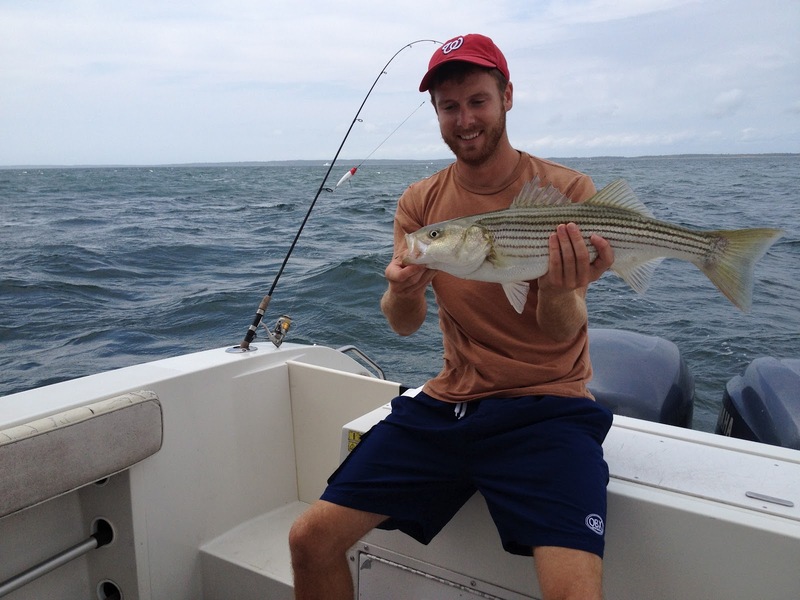 The initial run was fast and furious but ended rather quickly, so I was sure it was a big Striper. When the fish got close to boat, it turned and peeled off 50 yards of line so fast that I knew it was something else. Joe said it was probably a big blue, but even he was not sure. After its third spectacular run he said it could not be a blue. Finally we got her close to the boat and his boys said it was a Mackerel. When Joe got a look he exclaimed "Holy Sh*t..its a Bonito". The only other Bonito I had seen was Trolling the ocean off the Vineyard last summer with Joe. To get one on a topwater plug was a hell of lot more fun and is something I will never forget. Lake Tashmoo is fed by freshwater springs and is connected to the Vineyard Sound by an inlet that was constructed by the Army Corp of engineers in 1938. Its a relatively shallow body of water and protected from the wind. This made for perfect topwater conditions. We has a blast catching "schoolies" (18-24 inches) by either wading in or fishing from the Kayak. Danny was even able to catch several from a stand up paddle board. It was a great vacation with some excellent fishing thrown in as icing on the cake.